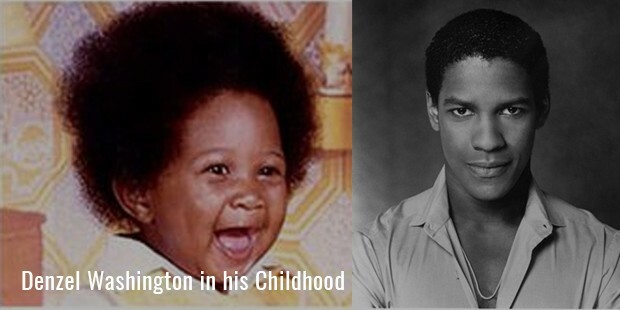 Denzel Washington was born on December 28, 1954 in Mount Vernon, New York City. He was admitted to the Pennington-Grimes Elementary School where he studied till he was 14. After that he was sent to a private preparatory school called Oakland Military Academy. After that he attended the Fordham University from where he earned a B.A. in Drama and Journalism. He also played basketball for his university and was really good at it, thus making it difficult for him to decide on which career to pursue. But after a friend’s suggestion, he decided to try out acting in stage plays. He went to the American Conservatory to further enhance his skills and was given the title roles in the plays ‘The Emperor Jones’ and ‘Othello’. The appreciation he got from the critics convinced him to continue in the field of acting. With his impressive performances in the plays, he moved to New York in order to pursue a full-time career in acting. In 1977 Denzel made his acting debut in the television film ‘Wilma’. He had to struggle for a number of years in order to get noticed and accepted in the industry that was dominated by white people. Denzel being an Afro-American found it difficult to get a break in Hollywood but got his first chance in the film ‘Carbon Copy’ (1981). The film did not make any impact at the box-office but he came into the spotlight with his performance as ‘Dr. Phillip Chandler’ in the Television drama ‘St. Elsewhere’ which ran from 1982 to 1988. During this period he took every opportunity given to him including films, television and stage roles. In 1987 his performance in the film ‘Cry freedom’ drew high critical praise and got him an Academy Award nomination for Best Supporting Actor. This was the break that Denzel was searching for. After this he made most use of his new found lime light by acting in highly dramatic films like ‘Mighty Quinn’, ‘For Queen and Country’ and ‘Glory’. 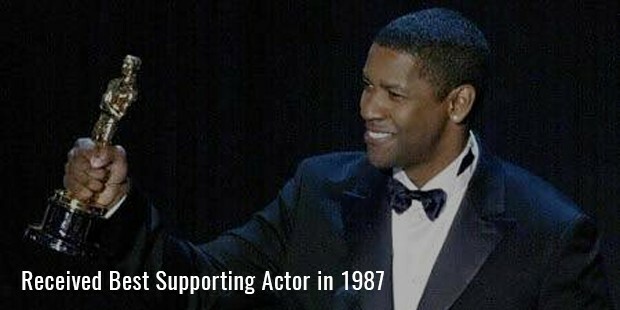 For the 1989 film ‘Glory’ he won the Academy Award for Best Actor in a Supporting Role. Within eight years of his debut, he had gone on to win an Academy Award. This was a huge achievement for this rising Afro-American drama star. 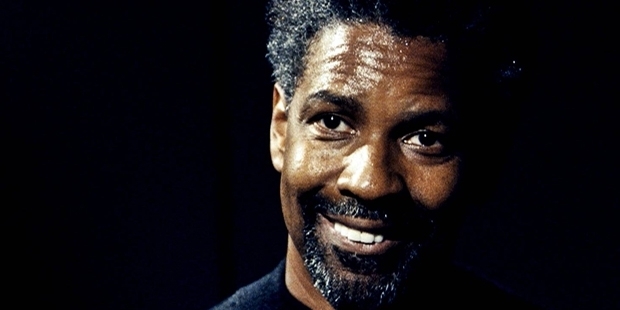 With this award, Denzel was now being offered leading roles in films. In the 1992 film ‘Malcolm X’ his portrayal of Malcolm X gave him rave reviews from critics and also earned him an Academy Award Best Actor nomination. He stood climbed the steps of stardom in Hollywood by giving great performances in hits like ‘Philadelphia’, ‘The Pelican Brief’ and ‘Much Ado About Nothing’. He won the Golden Globe Award for Best Actor for his lead role in the 1999 film ‘The Hurricane’. In 2000, he starred in the film ‘Remember the Titans’ which grossed more than $100 million. 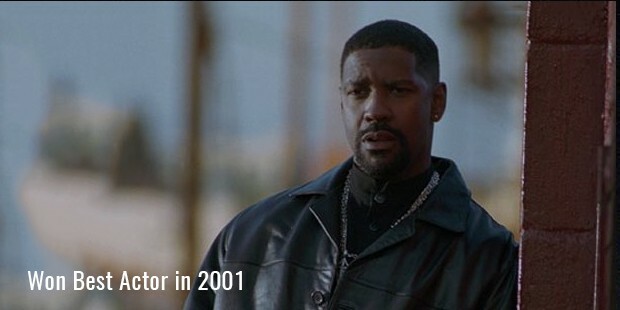 In 2001, he won the Academy Award for Best Actor for the film ‘Training Day’. Denzel Washington has established himself both as a commercially and critically successful actor with his superlative performances. He has been a true entertainer for over two decades providing engaging and wholesome drama in all his films. Throughout the 2000’s he has been part of super successful commercial films like ‘Inside Man’, ‘The Book of Eli’, ‘The Taking of Pelham 1 2 3’, ‘Flight’ and ‘Unstoppable’ which have collected close to $1 billion at the box office. 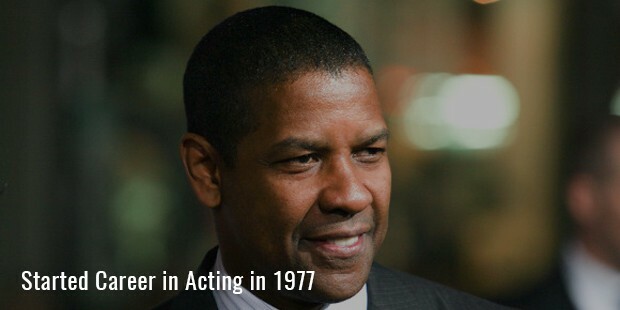 From being a multi-talented kid, Denzel Washington has overcome numerous hurdles to become one of the most successful actors of Hollywood. He has gone on to become one of the most accomplished Afro-Americans in the last century.